Passed in 1873, the Comstock Act banned 'obscene' materials from the mail without defining obscenity, leaving it open to interpretation by courts that were hostile to free speech. Literature that reflected changing attitudes toward sexuality, religion, and social institutions fell victim to the Comstock Act and related state laws. Dr. Edward Bliss Foote became among the earliest individuals convicted under the law after he mailed a brochure on birth-control methods. 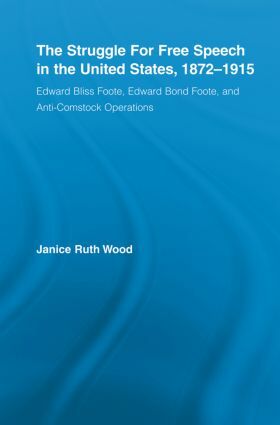 For the next four decades, Foote Sr. and his son, Dr. Edward Bond Foote, challenged the Comstock Act in Congress, legislatures, and courts and also offered personal assistance to Comstock defendants. This book chronicles the Footes’ struggle, examining not just the efforts of these cruising champions of freedom of expression and women's rights, but also the larger issues surrounding free speech and censorship in the Gilded Age of American history.